This Friday, February 22nd, from 5pm-10pm, Pittsburgh’s Heinz History Center will host the 45th anniversary celebration of “Night of the Living Dead!” The event will consist of a zombie contest loaded with prizes, a screening of “Night Of The Living Dead” film, and a behind-the-scenes tour of the history center’s newest exhibit. Light snacks and Alcoholic beverages will be available throughout the evening. There’s also a few extra surprises, but you must attend to see for yourself! This is a MUST ATTEND experience for all zombie and horror fans! The event is sponsored and co-hosted by The ScareHouse Haunted Attraction and House of the Dead zombie store. Watch “Night of the Living Dead” at the History Center… if you dare. The 1968 cult classic, which revolutionized the horror genre, was filmed in and around Pittsburgh by the “Godfather of Zombies,” George A. Romero. This year celebrates its 45th anniversary. Frightfully fun snacks and refreshments, including alcoholic beverages, popcorn, and retro candy, will be available for purchase. 5-7 pm: Behind-the-scenes tours of the History Center’s new exhibition, 1968: The Year That Rocked America. 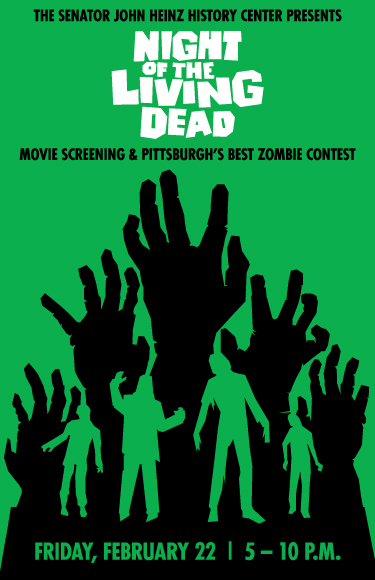 7 pm: Pittsburgh’s Best Zombie Contest (judged by Scott Simmons; Creative Director of the ScareHouse) followed by a “Night of the Living Dead” screening. The winners of the inaugural Pittsburgh’s Best Zombie Contest will be crowned the Zombie King and Zombie Queen of Pittsburgh. 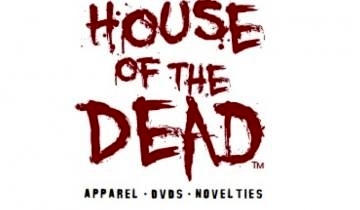 The two winners will each receive a prize package including a ScareHouse prize coffin with two RIP passes to The ScareHouse 2013, and merchandise from House of the Dead, Pittsburgh’s premier zombie store. To enter the contest, simply show up zombified and ready to scare! The “Night of the Living Dead” screening and Pittsburgh’s Best Zombie Contest are free with regular museum admission. This event is expected to sell out, so visitors are encouraged to arrive early! For directions and more information about this event visit their official site at www.heinzhistorycenter.org.